A very small uptick for the Conservatives in the polls this week: they’re up 1 point in the UK Polling Report average, with “others” down 1 and Labour, the Lib Dems and UKIP holding steady. 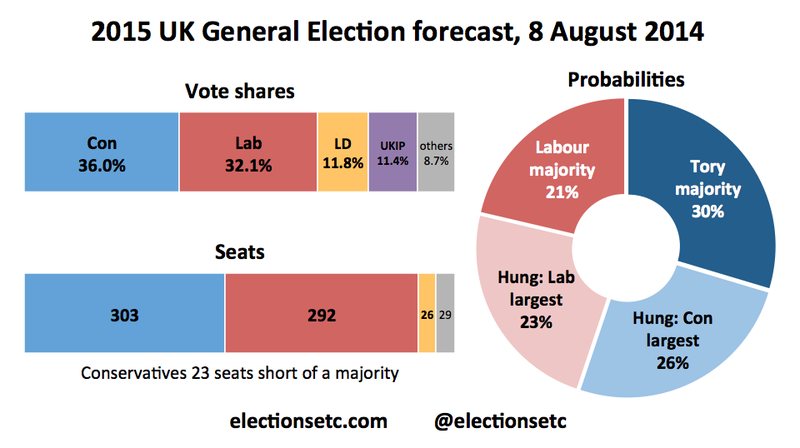 It moves our forecast roughly back to where it was three weeks ago, undoing the gains Labour made the following week. The Tories’ position as slight favourites to win the most seats has improved a touch: from 52-48 last week to 55-45 now. Their chances of winning a majority are up from 26% to 30%, though that’s still lower than at any point from when our model launched in October to June. For future reference can you please explain how you use the UK Polling Report data. You say above that your input was 33/36/8 for the 3 main parties but UKPR were showing a weighted average of 32/36/8 for the whole of last week, the same figures you used for your 1st August update, until Monday morning this week, 3 days after the 8th August update. Do you get prior access to their weighted figure, or do you use the unweighted poll data, or was this week’s 33% a mistake ?